I pray you are not Hungarian or else I shall be forced to eat you! Who is Corneliu Vadim Tudor? Ah, good question! Who isn’t he is the better question though! Corneliu Vadim Tudor, known as CVT to his friends (and I consider myself his BFF naturally – oh how the hours fly by as we swap and compare different crazy styles of sunglasses) is actually Romania’s funniest comedian. Romania is a small land.. and comedians are hard to come by. But this guy is the best! I saw him at the Just For Yuks comedy club down in Tirgiu Jiu and he totally has this whole bit where he comes out yelling and pounding his fists and spittle flying from his prodigious jowls, screaming and ranting about mafia and thieves and how Hungarians are secretly running everything. Hilarious!!! True story: in early 2007 I was living in a little village in the mountains and the only channel we could get on TV was TVR1 so we watched whatever came on. And there was this old lady there and every single time CVT came on the TV and went into one of his Fidel Castro slash Nikita Kruschev tirades, SHE would get just as worked up and fired up and zealous and nutball as CVT. Watching CVT is awesome. Watching CVT with a fired-up insane old villager lady is PRICELESS! I think just about every European country (including Merry Olde England) has a super racist, nationalistic ultra-patriotic political party. Well Romania’s is PRM. It’s fun for laughs but that’s only because they have no power. For instance, many moons ago when I first came to Cluj, the local mayor was a PRM lunatic by the name of Gheorghe Funar. Complete psychopath. Just went bonkers. Every last scrap of public land, buildings, lightbulbs, walls, park benches you name it, he had painted in the Romanian colors (red, yellow, blue). It was like a psychedelic trip on some very, very bad acid. If that weren’t enough, he was also a useless mayor. He almost bankrupted the town with the Caritas scheme and also chased away Coca-Cola, who ended up building their big factory near Oradea instead. Good news though is Funar is most mostly retired and spends his days shouting at the walls for being Hungarian traitors. And CVT gets about 3 votes every presidential election. Whew! Seriously though, don’t miss CVT’s shows! He’ll be playing at Caroline’s until next Tuesday and then at the Improv all next month! Previous Post Who? What? Huh? 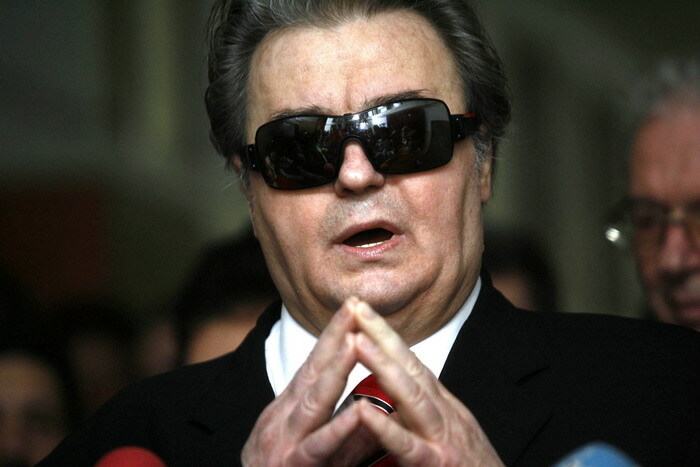 Next Post Nicolae Guta, (Ex) King of all Romanians! He’s also known as “WC Tudor”, for reasons easy to understand. Pingback: Blogroll Updated « I'm More Romanian Than You!